After sending out the last edition of The Innsider, I received several requests for the recipe for the Inn's cream of pear soup. This recipe is an original of mine that I love to fix for guests on warm, sunny days. So here it is. Peel, halve and core pears. Place juice concentrate (still frozen), Cool Whip, nutmeg & sugar in blender. Blend until smooth. Add pears. Blend until desired consistency is reached. Serve chilled in small glass bowls. Garnish with fresh mint leaves. Homemade sweet bread or muffins on the side add just the right touch. 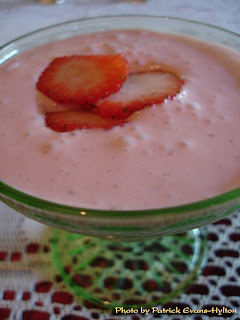 I have several variations of this recipe that I use depending on what fruit is in season. Our guests particularly enjoyed this Cream of Strawberry version that I served last spring with fresh strawberries from the Inn's patch.